The beauty of animated films, along with the striking colors and illustrations, is that directors can shape the film to be exactly how they want it to be. Unlike films with human actors, ideal characters are created to fit the exact demand for the movie. In Ratatouille, a film by Disney Pixar, many people wonder, “why a rat”? Why did they pick a rat, of all creatures, to be the “little chef” behind the entire splendor in the kitchen? The reasons the animators decided to use a rat is to bring significance to how the little ingredients can make dishes spectacular, and to really portray the joy that goes into cooking through the rat’s movements. 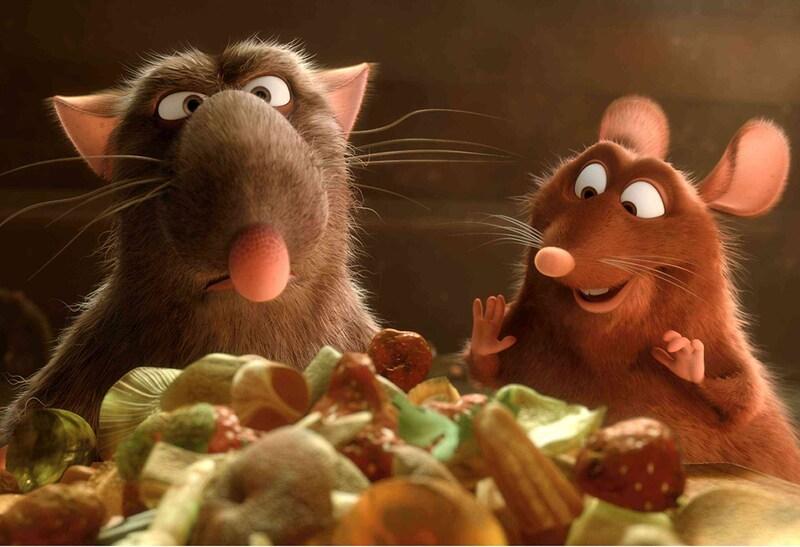 Ratatouille is a film about a rat, Remy, who is a very intuitive chef. But, the only way he can cook in an actual kitchen is by hiding under the hat of Linguini, his human friend. Remy’s talents stem from his elevated senses, and he uses his sense of smell multiple times to make magnificent dishes. A rat’s sense of smell is more pronounced than any other small mammal, and is especially superior to a human’s sense of smell. In the clip, Remy takes in the smell of all the ingredients, and really emphasizes the motion of wafting. It is ironic because the cooks view rats as revolting creatures that would never be allowed in the kitchen, but logically rats would make skilled chefs due to their elevated sense of smell. A rat’s sense of smell is so defined that they could easily make dishes that humans would never think of, just as Remy does in the clip. Remy’s combination of human-like moral consciousness and rat-like instinct make him a unique hybrid that can only be brought out through animation. Though Remy is this unique hybrid with a human conscious, his size still plays a large factor. He must utilize utensils, ingredients, and other kitchen gadgets that are small and easy to handle, because he cannot pick up and use very large instruments without the help of Linguini. This made the small kitchen ingredients look larger. In the clip, when Remy handles herbs, many are as big as he is. These things would have much less emphasis placed on them if a larger being was handling them. Since Remy is the one handling the ingredients, it allows for a visual representation of the “big flavor” that these ingredients have and drives the viewer to analyze what Remy is putting in his dishes. Also, Remy’s petite stature allows the audience to notice the details of the smaller ingredients. In the clip, you can see the lines on the chives, the indentions in the garlic, and veins on the leaves of the herbs. The colors of the ingredients are bright, and Remy almost looks like he is in a “jungle” of kitchen ingredients when he stands in the middle of all of them. The detail is what makes the clip beautiful, and the detail can only be noticed through the viewpoint of something small, such as Remy. The small size of the rat also allows the animator and director to put together some amusing shots to illustrate how the dishes are being prepared. The fact that Remy must leap, skip, run, and dodge in order to grab ingredients for his soup adds this sense of joy when he is cooking, something that the movement of human hands just cannot express. Oddly enough, Remy is capable of expressing quintessentially human emotions because his small size as a rat. It is quite funny how the rat, something that is usually seen by humans as wasteful, dirty, and pitiful, is the character receiving the most pleasure in this particular kitchen. The kitchen seems like it should be scary territory for Remy, but ironically he treats it like a children’s playground. Remy bounds over the pot to pour in some salt, races up a spoon to throw in some garlic, and is constantly tossing and energetically stirring the concoction throughout the scene. The effort that Remy must put into getting from one end of a counter to another, and the obstacles that he faces not only allows the animator to have close ups on the food that he is going around, but this constant, jubilant movement engages the viewer and really makes one pay attention to the beauty and joy of everything that is going into the dish. Why a rat? Remy the rat’s talents lie in the kitchen, though paradoxically many kitchens see a rat as something that is disgusting and undesirable. The animators were able to make Remy a bridge character between human and animal, and allowed him to use human consciousness while acting on the instinct of a rat. Through Remy’s small size, animators were able to put significance on the varied, smaller ingredients that many people overlook when putting together a meal. The smaller ingredients seemed larger and more detailed, and it is expressed to the viewer that these ingredients, as opposed to bigger ones, (such as meat or large vegetables) changed the soup in this clip from something bland to something spectacular. Remy’s adventures when physically cooking due to his small size also allowed a sense of joy and happiness to radiate from those scenes, and this engages the viewer into looking at every detail of what goes into a dish. Through all of these factors, the animators were able to create an ironic character to show how many ingredients that we overlook normally bring beauty and taste to even the simplest of dishes.